Join us in the English Nationality Room in the University of Pittsburgh's Cathedral of Learning, for a presentation on the life and work of British Victorian lady traveler, writer, suffragist and Egyptologist - Amelia Edwards, including public reading of her most famous ghost story, The Phantom Coach (1864). MEMBERS LOGIN FOR $8 REGISTRATION. To become a member, visit the Britsburgh membership page. Light Victorian-era British and Egyptian refreshments will be served. "It may be said of some very old places, as of some very old books, that they are destined to be forever new . . . The more we study them, the more we have yet to learn . . . Time augments rather than diminishes their everlasting novelty." developed a keen passion for Egyptology and dedicated her life to the discovery, exploration, and preservation of Egyptian antiquities. She published her two most famous travel books about her experiences in Egypt, A Thousand Miles Up the Nile (1877) and Pharaohs, Fellahs and Explorers (1891). Fans of Barbara Peters' popular Amelia Peabody mystery novels will recognize Amelia Edwards as the inspiration for Peters' Egyptologist heroine. Kim Szczypinski of Duquesne University will give a talk about Amelia's many-faceted life and work, including her surprising connections to Pittsburgh. 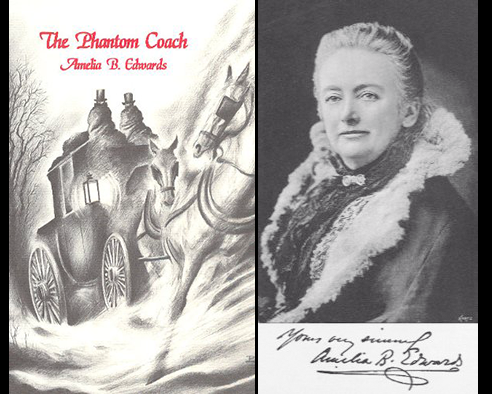 Plus, as a special treat for Halloween, Andy Kirtland, actor and Artistic Director of Pittsburgh's New Renaissance Theatre Company, will do a dramatic reading of Amelia Edwards' most famous ghost story, The Phantom Coach (1864). 6.30-7PM Light British and Egyptian refreshments will be served in the Cathedral of Learning's Common Room. 7.45-8.20PM Live reading of The Phantom Coach.